LA's Urban Gardeners are faced with a tough choice, work small plots on City of LA property and pay a 380% rental increase or work the soil on private property and risk taking the first step toward a life of crime. The next time you're at Starbucks and you see those bags of used coffee grounds that can be used as fertilizer, stand back. Used improperly, those grounds could end up in a private compost pile, violating an old law that prevents individuals from gathering table scraps from restaurants to be used in a private compost pile. An obscure legal relic that has been enforced in Los Angeles against a private gardener. The next time you're in your neighborhood and you see a talented gardener teaching community members, stand back. Passing on knowledge at a residence can be construed as running a home based business with guests that exceed the limit of one per hour. Tupperware parties are acceptable but teaching people to grow food that will go into the Tupperware containers violates another obscure legal relic. It has been enforced in Los Angeles against a private gardener. The next time you're in your front yard and you look at the parkway strip between the sidewalk and the curb and imagine how beautiful it would look with some edible landscaping, get a lawyer. A grassroots "Food and Flowers Freedom Act" campaign prompted the City of LA to recently revise its parkway rules, resulting in the approval of turf alternatives that include strawberries, as long as they don't grow taller than 2 inches. Even if your only consideration is to simply plant drought resistant plants in lieu of traditional water-hogging turf, think twice. The permit process for doing the right thing is approximately $400. The next time you're at the Farmers Market and you look at the wide variety of flowers, nuts, fruits and vegetables and wonder where it came from, it might be your neighborhood. The students at North Hollywood High School work the soil and then work the market, learning everything from composting to investing. Silver Lake Farms sells locally grown organic cut flowers, a callback to a time when flower production in Los Angeles was a backyard enterprise that allowed women to add to their household income. Keep in mind, laws passed in the 40's and 50's that were designed to aid the development of Los Angeles made it illegal to simply grow and sell flowers. Again, garden at your own risk and always consult a lawyer. The next time you're at the grocery store, stop and give thanks. In many parts of LA, residents live within walking distance of dozens of liquor stores but no grocery stores. The City of LA's response to the food justice crisis is to loan liquor stores a refrigerator on the condition that they stock it with lettuce and tomatoes. Another option would be to have a Master Gardener take a bag of seeds and teach a class, perhaps on one of the many empty lots that litter the landscape, and give the gift of sustainable self-sufficiency to the community. Of course, gardens are the gateway to a life of crime, hence the liquor store partnership. LA's most recent assault on Community Gardens is just the latest in a long list of municipal obstacles that prevent the people most in need from living sustainable lives of self sufficiency. 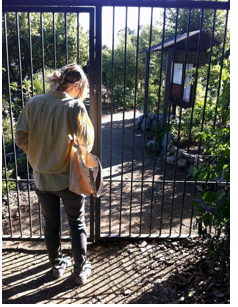 It comes at a time when the City of LA should be doing the exact opposite, committing to more community gardens, supporting the urban farmers and rewarding them for their contribution, not gouging them with a 380% increase in rental fees. Locally grown flowers, nuts, fruits and vegetables stimulate the local economy. That alone should end the debate and get the Mayor into a pair of overalls. Local produce makes it to market without huge shipping and trucking costs, resulting in fresher food that is cheaper. The food in our markets typically travels more than the average Angeleno, a trend that comes with tremendous negative environmental impact. Locally produced food is an essential component of a sustainable big city. Local "Distributed Agriculture" allows more people tending smaller plots to increase the variety of food within the community while breaking our dependency on large industrial agriculture which has proven its capacity for catastrophic collapse. The "Black Swans" of agriculture have resulted in Bee Colony Collapse Disorder, poultry recalls, e-coli deaths, and large scale Concentrated Animal Feeding Operation (CAFO) disasters that threaten the stability of our precariously balanced agricultural network. The City of Los Angeles has an obligation to do the right thing for the people of LA and that means getting behind groups such as the Environmental Change-Makers and Liberty Hill as they address long-term solutions that will turn LA's food deserts into food oases. Most of all, it means treating LA's Community Gardeners and Urban Farmers like heroes, not like criminals.